STURGIS, S.D. - The annual Scott Peterson Motors Food Drive is underway! Non-perishable food items and funds can be dropped off at either dealership in Sturgis or Belle Fourche. As an added bonus to generate more donations, those bringing five or more non-perishable items will receive $10 off their next service bill. Scott Peterson Motors has also pledged $100 from every vehicle sale towards the drive. 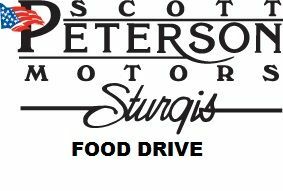 For the last seven years, Scott Peterson Motors has beat their existing record for money and food generated during the food drive. In total, the drive has generated nearly $87,000 and almost 13 tons of food for families living in the Sturgis, Belle Fourche, and surrounding areas. Funds raised are administered by the Belle Fourche Ministerial Association and Sturgis Kiwanis Club splitting the funds and food among groups to provide food, shelter, and utilities for needy families in the Northern Hills.